Douglas Miles, "On the Road to Vice," Epson Ultra Premium Photo Luster, 12 x 16"
A series of Native American figures appear to look through gallery windows towards new developments in the heart of the local downtown arts district, where some lament the displacement of artists in recent years. Douglas Miles created the mixed-media collage installation, which prompts us to consider a far vaster expanse of time and space. It includes life-size images of family members and historical figures, including Geronimo, placed side by side to reference both the historical displacement and contemporary marginalization of indigenous people. The figures are surrounded by text comprising the names of Chiricahua Apache leaders and chiefs. The words “everyday sacred,” also the title of the exhibition, are scrawled with a silver Krink marker. The installation flanks the interior gallery space, where curator Jeff Chabot has conceived a quiet but powerful presentation of 28 framed, black and white photographs featuring everyday moments in the rural setting of San Carlos, Arizona. It’s the site of San Carlos Apache Nation, where the artist is based. The photographs were taken using Apple iPhone 7 and iPhone X cameras, reflecting the artist’s wider practice, in which he uses salvaged objects and materials that are readily at hand. Chabot’s selections favor spontaneous moments over staged ones, creating a sense of intimacy while heightening the exhibition’s emotional impact. 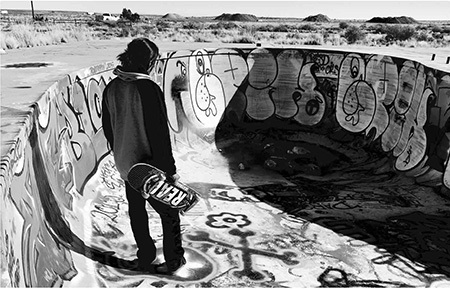 A young man holds a skateboard, overlooking an empty pool covered in graffiti (“On The Road to Vice”). A woman stands outside a vehicle, applying makeup (“Jojo’s Warpaint”). Women gather around a small child (“Baby Jonell”). Miles uses the camera to push back against the objectification and fetishization of Native American people and cultures, and the racism at its root. He opens a window onto everyday realities, and slams the door on misplaced romanticism. “Everyday Sacred” is an ode to the broad canvas of human experience and community that elegantly conveys the fluidity between present, past, and future.